The concept of playing Android games on a TV is hardly an original premise, with Ouya being by far the most well-known means of doing so to date. 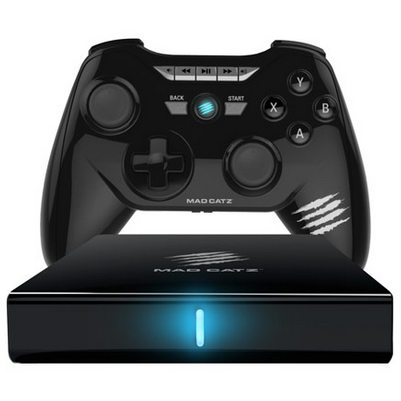 Yet that Kickstarter-backed console isn't for everyone, and if you've wanted to get your hands on something packing more power under the hood, then your eyes have probably landed on the Mad Catz M.O.J.O. at some point over the past several months. Well, the wait is over. The $249 console is now available from a handful of retailers, including Mad Catz directly. Some retailers, such as Amazon, still show the console as out of stock. Yet you can already pick one up from GameStop, Newegg, and TigerDirect. While it may be worthwhile to pick up the console on the merits of its specs alone - 1.8GHz Tegra 4 Processor, 2GB of RAM, 16GB of internal storage, Android 4.2.2 - what really sets this system apart is its access to the Play Store. Unlike with Ouya, you don't have to repurchase games you already own in order to install them on the M.O.J.O. Inside the box you will get the console, a game controller (which will require two AAA batteries) an HDMI cable, and the power cord. If you want to get your hands on one, hit up the link below.